FAIRFIELD, Ohio -- Ann Becker isn’t an experienced campaign manager or a famous politician, but the West Chester Township mom knows how to knock on a door and deliver a tough political sales pitch to strangers standing on their stoops. After all, she was a Girl Scout growing up. “One thing I learned from selling Girl Scout cookies: 30 percent of doorbells don’t work. I don’t know why doorbells are so unreliable, but they are,” Becker told a group of 75 Republican volunteers at a Fairfield banquet hall last week, where she doled out advice on how to talk to strangers about the upcoming election and the Republican Party's presidential nominee, Donald Trump. “So, knock on the door," Becker urged. Trump’s presidential campaign has been exceptionally slow to launch in Ohio, including key battleground areas such as Hamilton County. Last Friday, his campaign announced plans to open 16 new offices around Ohio; the announcement came months behind Hillary Clinton’s campaign opened a network of sites throughout the state. 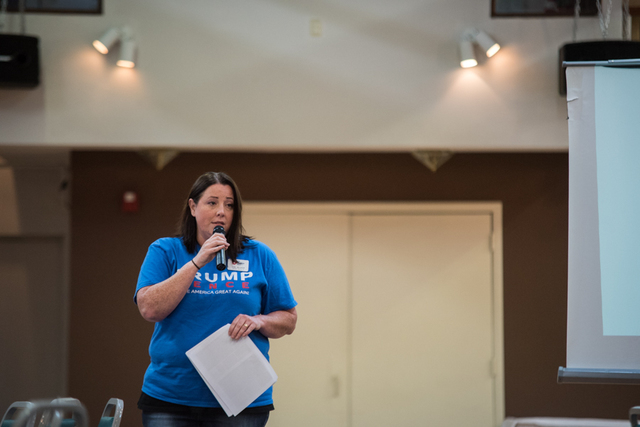 But Republican leaders in conservative Butler County have pushed forward by opening a volunteer office ahead of Trump’s own campaign, selling gear and training volunteers earlier this month. Volunteers will kick off an 80-day door-to-door blitz on Saturday, along with the rest of the state’s Republican knockers. 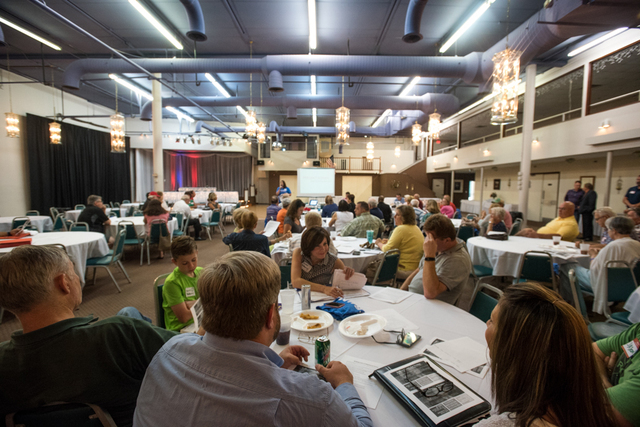 The focus in Butler County will be on Independents and Republicans. They’ll prioritize talking to voters about three candidates: Trump, U.S. Rep. Warren Davidson and Sen. Rob Portman. Becker has a laundry list of how campaign volunteers should, and shouldn’t, act when they randomly approach a house in hopes of persuading dwellers to vote for a candidate. Some of her rules seem insignificant -- take off your sunglasses, she said, to make the person feel comfortable -- while others are important: don’t go into a stranger’s home. "Oh and, gentlemen, please don’t use a loud 'cop knock,'” she quickly reminded the crowd. She hopes each of her rules will help turn Butler County to the most Trump-friendly region in all of Ohio. The Ohio Republican Party expects it to be, a spokesman told WCPO. The goal -- to get 115,000 residents to vote for Trump on Election Day -- is lofty. It involves turning out more than a third of the county’s population to cast the most votes for the Republican nominee in the county’s history. Republican leaders think it’s achievable. County voters cast nearly 110,000 ballots for George W. Bush in 2004 and the population has since grown by more than 30,000 people. Simply put, Republicans rule in Butler County, a mix of booming suburbs and sprawling farmland. It’s the area that turned out former Speaker of the House John Boehner and kept him in office for 26 years. Out of the more than 30 state or county officeholders and judges that represent Butler County, only one is a Democrat. Nobody doubts the county will go for Trump. The biggest question is how many votes he can squeeze out. “We’re going to knock every single door in Butler County and turn them into Trump votes,” Butler County Republican Chairman Todd Hall said in an interview with WCPO. Trump is clearly relying on strong turn voter turnout in suburban areas like Butler County, smaller-sized cities and rural regions. He has focused his campaign visits to Ohio throughout the southern and eastern parts of the state, stopping in places such as West Chester, Youngstown, and the quaint city of St. Clairesville. His campaign offices operate in similar locations, including Clermont, Warren and Butler counties. Butler County Republicans will only be able to cancel out some of Cuyahoga County’s votes. In 2012, President Barack Obama picked up more than 447,000 votes from Cuyahoga. GOP leaders in the county know a lot is riding on them. They’re equipping volunteers with state-of-the-art equipment: burner smartphones, apps that have detailed information about every voter, including how they’ve registered in the past, when they’ve voted and how many people live in the household. Someone doesn’t answer the door? Come back again later. Volunteers are asked to scan the front yard of homes and look for clues: see a car in the driveway with a National Rifle Association sticker on the bumper or a military flagpole in the yard? Make note of it in the app. Details like that -- recorded in a smartphone app that sends information directly back to the Republican Party -- help GOP leaders decide who to send mailers to, who to follow up with in a phone call and how to talk to them. Volunteers have to be prepared for different conversations, depending on who they encounter -- Republicans, Democrats or swing voters. Michael Connaughton has been in a few awkward conversations since he started knocking doors for Trump and the Republican Party in May. He works full time but spends 10 or 15 hours a week talking with voters in Sharonville. He estimates he’s stopped at more than 1,000 homes throughout the city, which stretches through Hamilton and Butler counties. Many have been friendly to him, Connaughton said. Others have quickly booted him from their doorsteps. But there’s a certain kind of door knock that takes extra finesse: the one where an unsure voter answers. Connaughton’s shtick is to leave uncertain voters with a reminder that the future of the Supreme Court will rest with the next president.